Recently, Fantasy Flight Games has had some good success with the Android universe, both with the appropriately named "Android" as well as "Android: Infiltration". 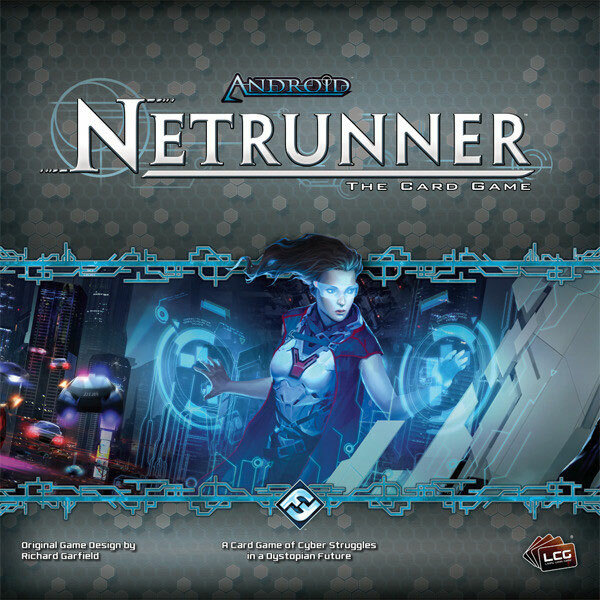 These two games, along with their latest release, Android: Netrunner, are set in a cyber punk, dystopian universe, where Runners batlle Corporations for the balance of power, and data, in a world completely changed from our own. Netrunner was originally released in 1996. Designed by Richard Garfield, it was a Collectible Card Game and was well received but Magic was the dominating force, and as such, Netrunner passed on after a brief run (Pun intended). 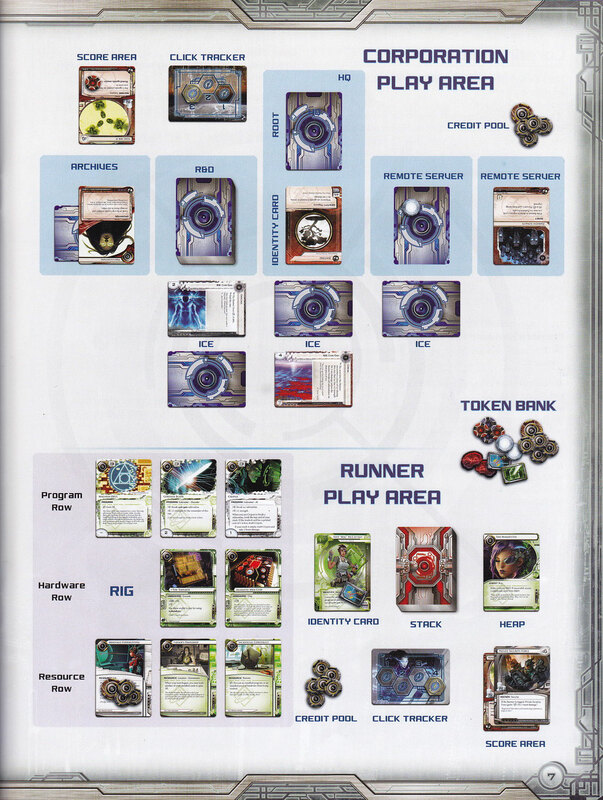 Today Fantasy Flight has redesigned Netrunner in their Living Card Game format. Every once in a while though, great artwork, unique game design, an engaging and fun experience come together in an over hyped package, delivering a great big pile of dissapointment. 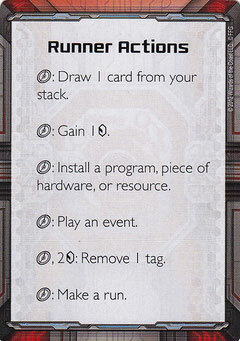 Thankfully, with this re-visioning of Netrunner, that is NOT the case! Android: Netrunner is easily the most unique card game of any kind I have had the opportunity to play! Its assymetrical design, as well as highly tense action and tough decision making has come together to provide an amazing experience! Before we get into more thoughts, let's explain as much as we can! Netrunner is a two player game, with one person playing as a "Runner" and one playing as a "Corporation". Runners are like Rogue Agents who are trying to access the evil Corporation's servers and Agendas to steal points and win the game. Corporations are trying to Advance their Agendas, protect their Servers and Data, and score points to win the game. Both players will have completely different set ups, game play areas, and turn actions, which makes playing on either side of the table, a unique, engaging, and exciting experience. As an example, you can click on the below image to see the differences in terminology and game areas for both players. Netrunner provides a LOT to learn. That said, the only really challenging part about the rules, which you can see here at Fantasy Flight's site, is the taxonomy used. This is a very "Technically minded" game, with words like "Install", "Rez", "Remote Server", "Ice", "Programs" and many others being used. Once you have the opportunity though, playing as either a Runner or Corporation, to make the correlations to what these things mean in "normal everyday game terms" then it is actually quite an easy game to learn. At its heart, Netrunner is a bluffing game. As a Corporation, I will be playing (installing) cards to the table, that will represent Agendas I will try to score or setting traps that look like Agendas that will coerce the Runner in the wrong direction. My goals are simple, to either Flatline the Runner by dealing specific damage to him or Advance and score Agendas worth 7 points. The Runner meanwhile will be setting up a Rig, by playing cards that consist of Programs, Hardware, and Resources, allowing me to make better, and more effective Runs against the Corporation’s installed Servers, in the hopes of accessing Agendas and stealing them to score the points myself. 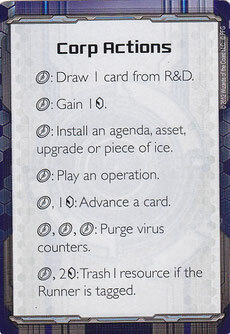 My goal is simple, steal 7 points of Agendas, or force the Corporation's R&D (Deck) to run out of cards. This may all sound complicated, and it is at first so I suggest reading the rules several times, and keeping them handy near you over the course of your first few plays, but after a short handful of games, the correlations come, and it's a simple enough layout and set up to understand. I have introduced this game to a few friends, who are neither technically minded nor fans of science fiction, and they have enjoyed it very much. The theme has detracted a bit from those types of players, but overall, they all agreed the gameplay, being completely different, added a great flavor and amount of excitement to the experience. The true fun in Netrunner comes when Corporation players have baited Runners to make Runs on Servers that end up being Traps, or for the Runner, they make the right decisions on which Server to run against and have the right resources to break through and pilfer the Agendas! The assymetrical nature of Netrunner will see not just different types of cards and layouts for each player, but also completely different actions they can take on their turns. As outlined above, each player gets an Action card, with the circle icon representing a term called a "click". Each turn, the Corporation has 3 "Clicks" to spend, and the Runner's have 4. This may seem unbalanced, but I assure you it is not. The "gem" looking icon with the slash in it is the symbol for a "credit". So for example, the 2nd action from the bottom on the Runner's card (on the right) says "Spend one Click and 2 Credits: Remove 1 tag. There are a lot of terms I could get into and spend all day explaining, like Virus, Tags, etc, but suffice to know, there is quite a bit of difference between the two players and how they will best use their resources. The artwork is also very well done. Each card, even the "generic" filler cards that can be used by anyone, provide a great amount of connection to the theme that match up well with this universe. The colors are vibrant, but not bright, and fit well with the Cyber Punk theme. While there are a lot of terms to learn, the cards do an excellent job of being well laid out and designed, so that logic prevails. Additionally, being a Living Card Game, means there will be expansions. There are complete deck building rules included, and their looks to be a great amount of support, both from Fantasy Flight Games and the community and fans, that will keep this moving for a long time! Some LCGs need to have more than just the core set. I have enjoyed the Lord of the Rings LCG for example, but I have learned that it is much better with the expansions packs, than just the core. With Netrunner though, I only own the one core set I purchased at my FLGS, and we have had a tremendous amount of fun with only it! Some people seem to like to get two copies of the core set at the get go, allowing for more of some of the key cards, but if you are unsure about investing in an LCG, this is one that the core set provides a great amount of fun and value in it. There are a LOT of LCGs available to you from Fantasy Flight Games, and more are coming, like Star Wars, but Netrunner is easily the best one produced to date. It blends a great theme, great artwork, logical design, unique gameplay, and a fast paced, edge of your seat engaging experience that will keep you coming back for more! Fantastic review! I appreciate the work you put in to making your reviews a cut above the norm. Netrunner is probably in my top five right now and I play it every chance I get. It is a fantastic game for all of the reasons you outline and I simply cannot wait for the new data pack next month. Thanks Aaron, I'm glad you liked it! I do my best to make them stand apart, so thanks! I can't wait either, they look great! Appreciate you reading, watching, and commenting! Thanks for being a fan! Good review, but your first card fan has an outdated version of ninja on it, and please learn when to use the apostrophe. Hi AC. Those are from Fantasy Flight's site directly, but I can pass it on to the marketing people there. Also, any example of your last comment is appreciated. Thanks for the fantastic review. The walk through of how to play was excellent for giving a feel for the flow of the game, a good companion to reading the rules. I particularly found this useful as I tried to play the original netrunner with a friend years ago; neither of us had played it before and we struggled to understand play dynamics, even once we had mastered the rules. I'm not normally a grammar nazi, but since you asked: 'At it's heart,' this is possessive of it, which does not get an apostrophe since "it" is a pronoun (only write "it's" if it is a contraction of "it is"). Also in several places you have written plural of agenda as "agenda's" - plurals do not have apostrophes, it should be "agendas". First, thanks, glad you like that. Second, I just went back and checked the blog on word and it doesn't have the apostrophes in there for the Agendas, but for some reason, and I just did this to check, the blog software adds them in an auto correct mode. Very odd. I'll have to check into that. Thanks for catching that! I think I figured out the issue in the auto correct piece and tested on a trial blog post, so hopefully that won't happen again. Once again, glad you like the review and appreciate the healthy discussion on editing. Thanks! Special blog software feature: auto-incorrect! Hah. Lovely review. I found out about this game the other day, and as a player of the original netrunner game I can only be happy it was re-released. The gameplay is essentially the same as The old version, which was excellent. It was a shame WotC abandoned it at the time, especially as the Silent impact expansion had been announced but never saw the light. I really hope this version will last a long time. Thanks Fred, glad you liked it! It's super fun. I only vaguely remember playing the original, but I know I remember I liked it. This one is super fun, and one of the best games released last year! Hope you enjoy it if you find time to obtain a copy and play! Tried to learn the original Netrunner in 2004 and failed. I am not considered to be a board or card game aficionado, but the reinvention of it has really captured my interest. Unfortunately I have to play a couple of friends over OCTGN, which I feel is a horrible interface, but alas the complexity of the keyboard actions is long forgotten when flat-lined by Jinteki's ambushes! I may just buy the orig Netrunner for keepsake. Thanks for the detailed review! Great review, my gaming group is usually 4 people so is it possible to play 2 separate games at once out of the starter box? Hi Jesta, thanks! It would be hard, only because there are "generic" cards you add to each starting corporation and runner decks and I believe there is only one set of each of them. That said, the base set, plus a Data Pack expansion may do it! Really great game! Thanks for a review!